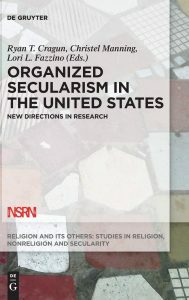 Organized Secularism in the United States: New Directions in Research, edited by Ryan T. Cragun, Christel Manning, and Lori L. Fazzino (Berlin: De Gruyter, 2017, ISBN 978-3-11-045742-1) 321 pp., Hardcover, $114.99. In November 2014, Pitzer College, home of prominent secularism researcher Phil Zuckerman, hosted the third international conference of the Nonreligion and Secularity Research Network (NSRN). Fifty-five scholars from nine countries attended.